An exceedingly rare find. 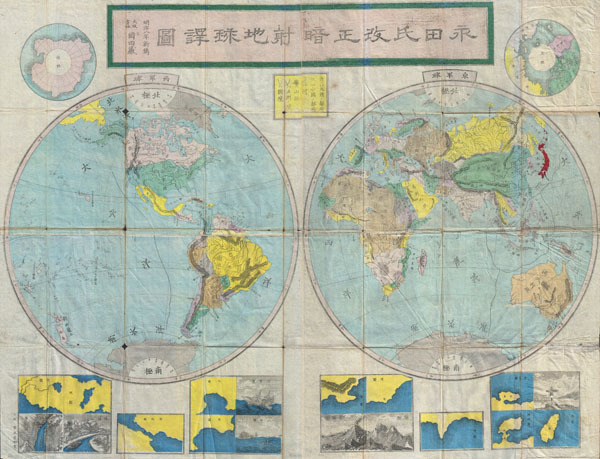 This is a Japanese map of the world dated to the 8th year of the Emperor's Meiji's reign, or 1897. Depicts the entire world on a hemisphere projection with smaller polar projections in the upper left and right quadrants. The national boundaries and geography in general is vague, as is common to Japanese maps of this period. Color coded according to region with Japan itself in bright red. Several harbor plans and views adorn the bottom portions of the map. All text in Japanese. Folds into its original boards. Good condition. Original folds exhibit some wear and intersection loss. Original boards. Else clean.